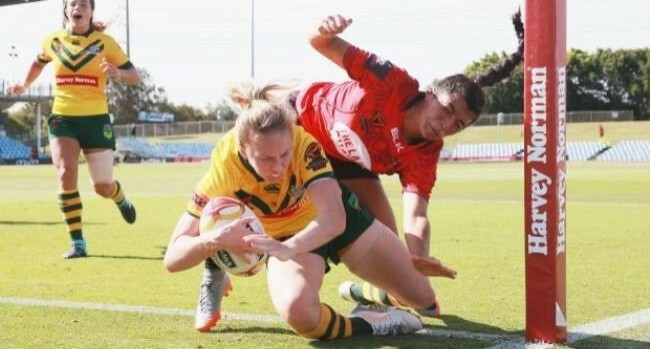 Australia has advanced into the 2017 Rugby League Women's World Cup Final after they thumped the Canada Ravens 58-6, following a masterclass from five-eighth Ali Brigginshaw at Southern Cross Group Stadium in Cronulla. The win sets up a mouth-watering clash with the New Zealand Kiwi Ferns in the World Cup Final as Australia aims to be crowned back-to-back champions. The Jillaroos scored at over a point a minute in the opening 40 minutes of play, before overcoming a small fight back in the second half to run 11 tries past the brave Canadians. Australia had a dream start to the match when Brigginshaw scored in their first set of the match after getting a lucky bounce from her own kick in behind Canada’s defensive line to open the scoring after just two minutes. Then, just three minutes later, Australia crossed over once again when powerful forward, Steph Hancock, carried multiple defenders with her as she moved across field before getting sight of the white stripe and forcing her way over the line. Already at a 12-0 disadvantage after just five minutes of play, Canada was beginning to have flashbacks to their 88-0 defeat at the hands of the Jillaroos earlier in the week. And unfortunately for the Ravens, Australia kept the foot on the gas and ran in another six tries before the half-time siren brought an end to the carnage. A double to upcoming centre, Isabelle Kelly, and Brigginshaw once again benefiting from a favourable bounce for her second of the half, helped Australia to reach an imposing 42-0 lead at the end of the first half. As the second half got underway, Australia came out of the sheds to meet a rejuvenated Ravens outfit who managed to draw first blood. With their best attacking opportunity of the game, Canada became the first team to score a point against the Jillaroos in over three hours of football, when Natasha Smith burrowed her way over from dummy half. Canada fullback, Irene Patrinos, had no problems adding the extras as Canada began to fight back against the immensely talented Australian team. Canada forced the match into an arm wrestle for the first 20 minutes of the second half, limiting Australia’s time on the ball and only conceding one try. But after Ruan Sims found her way to the line in the 57th minute, the floodgates opened as Australia ran in another two tries and ran away with the game to set up a blockbuster clash with New Zealand for the 2017 Rugby League Women’s World Cup. Australian coach, Brad Donald, was pleased with his teams overall performance but says a slow second half shows there is still room for improvement.